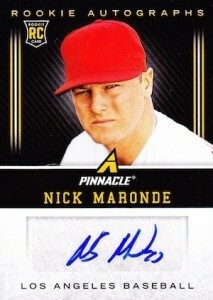 2013 Pinnacle Baseball marks the return of one of the brands synonymous with sports card collecting in the 1990s. 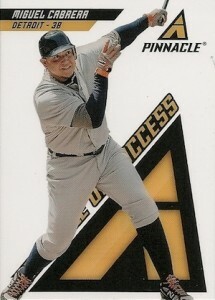 Although it's been used recently in hockey, the last Pinnacle baseball card set came out in 1998. 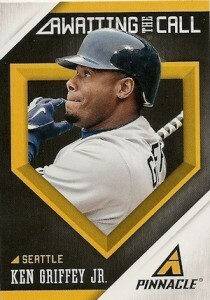 Not only is Panini bringing back the Pinnacle name, but several familiar inserts as well. 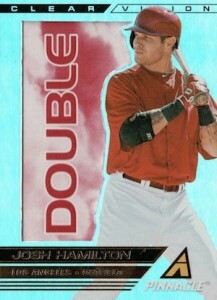 Leading the familiarity are a pair of base set parallels: Museum Collection and Artist's Proofs. 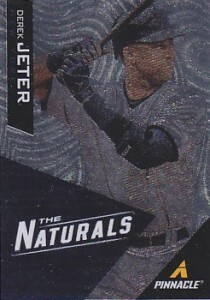 Museum Collection have a distinct foil look that used to be called Dufex. Today, Panini uses the name Nufex as the printing process is slightly different. Artist's Proofs come with a stamp noting their parallel status. 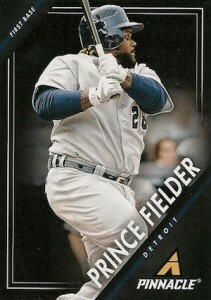 2013 Pinnacle Baseball hobby boxes have three Museum Collection cards and a pair of Artist's Proofs. 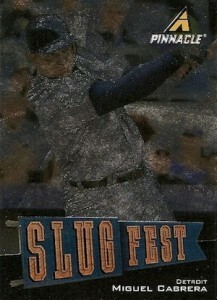 Slugfest (1:12 packs) is one of Pinnacle's best-known insert sets. 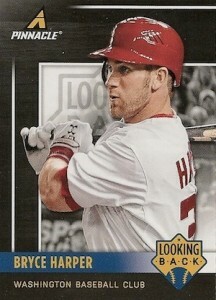 Focusing on baseball's best home run hitters, the cards are highlighted by a Nufex design. 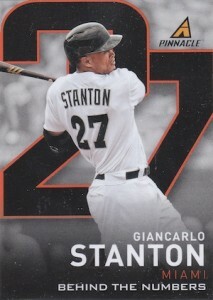 Other returning inserts include Team Pinnacle (1:12 packs), Swing for the Fences (1:12 packs) and Behind the Numbers (1:24 packs). 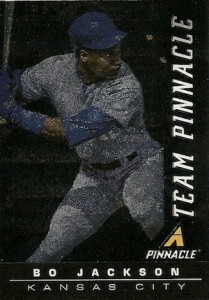 While not entirely new, Team 2020 (1:8 packs) is an extension of the Team 2000 inserts from 1992 Pinnacle Baseball. The cards focus on young stars. Awaiting the Call (1:6 packs) looks at ten players with credentials worthy of Cooperstown. 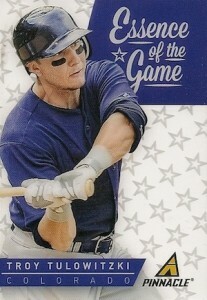 Pinnacle of Success (1:8 packs) is an acetate insert that celebrates 16 stars who are at the peak of their careers. 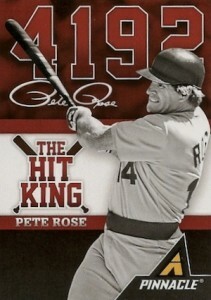 The Hit King Die-Cuts is a five-card set dedicated solely to baseball's all-time hit leader, Pete Rose. 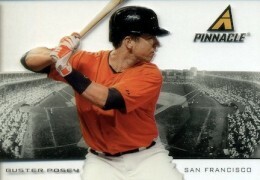 Other inserts in 2013 Pinnacle Baseball include Position Powers (1:12 packs), Clear Vision (1:8 packs) and Aces (1:24 packs). 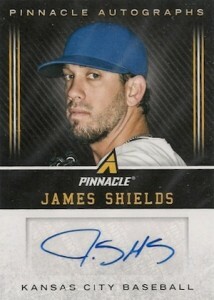 2013 Pinnacle Baseball hobby boxes also have a pair of autographs. 2013 Pinnacle Team Pinnacle #3B Mike Trout Ken Griffey Jr. PSA 10!! POP 4!!!! 2013 Panini Pinnacle Jay Bruce Auto!! #JB (Reds) Look!!! Hot!! 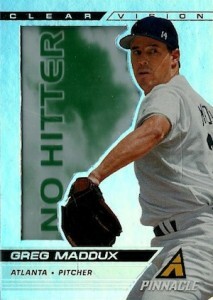 Good: Acetate galore, Nufex parallels and inserts look good, several nods to the 90s. 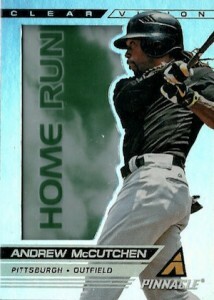 Bad: Way too many inserts, very generic feel to base cards. The Bottom Line: Pinnacle is back. Nostalgia isn't limited to just the returning brand name. It's in the inserts as well. Some are direct nods to the 1990s, others more indirect. And if you like acetate, there's plenty of that too. 2013 Pinnacle Baseball also has a lot of other stuff that's ultimately unnecessary. Overall, the set's return is a mixed bag that comes with a reasonable price tag. Parts of 2013 Pinnacle Baseball are fantastic. The almost-Dufex, Nufex cards run through both the Museum Collection parallels and retro-themed inserts like Slugfest, Team Pinnacle and Aces. These have a lot of pop and an equal amount of fun. The same can be said for the acetate inserts. Another nod to the 90s are the Clear Vision inserts. 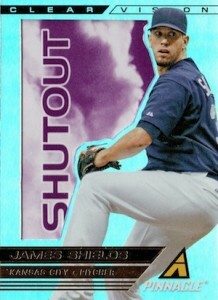 The mix of die-cut holo-foil and acetate appear inspired by 1997 E-X2000 Baseball. Bonus points for the cloudy backdrop in the acetate. There's also a tiered aspect to the set where some are more rare than others, giving it an old-school Crusade feel as well. That said, I found the massive subset names (Single, Double, Home Run, etc.) off-putting. The text ends up almost overtaking the player. The base design goes back to Pinnacle's roots with its black borders. The diagonal nameplates leave for some wasted space, but it's not bad. My bigger issue comes with the generic feel of the base set. 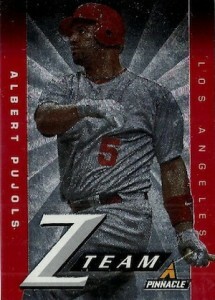 Panini is limited because it can't use MLB logos. 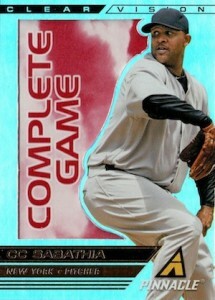 But those same logos give players a good chunk of their cardboard personality. 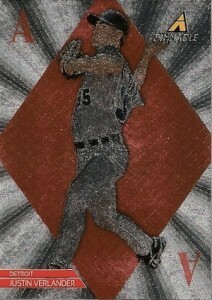 In this set you've got hitters in their batting stance and pitchers going through the motions. All are in plain jerseys against a generic background. The result often feels like what you see as a placeholder in a picture frame when you first buy it. I understand the limitations, at least to a certain extent, but it's time to try something different to help make players more recognizable and less generic. 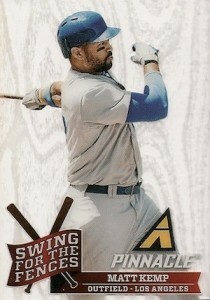 Perhaps Panini can design their own custom jerseys that don't mess with MLB trademarks. The way things currently stand, it's hard to connect with the players. For me, getting that better understanding of a player (or at least the perception of it) is a big part of what I enjoy about collecting cards. 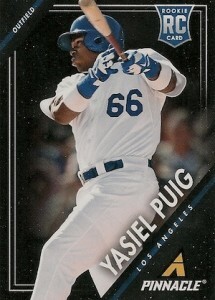 For a 200-card base set, 2013 Pinnacle Baseball covers the top players and a bunch of rookies (yes, Yasiel Puig is one of them). It also has some of the first 2013 cards of Ichiro and Matt Weiters, two players who don't currently have deals with Topps. Museum Collection and Artist's Proofs are a nice amount of parallels. The same can be said for the Nufex and Acetate inserts. They're all plentiful enough that they're not ultra rare, but they don't feel overdone. The same can't be said for other basic inserts. They come with no enhancements, just a theme and design change. I'd rather have a handful more base cards. Combine the unnecessary inserts with the small stack of doubles that I got and I'd probably have gotten a full base set or very close to it. It feels like these basic inserts exist largely to boost the insert count rather than compliment the overall release, let alone enhance it. The autograph checklist is big. Most of the names aren't superstars, but this isn't a wildly expensive product so that's not a major issue to me. 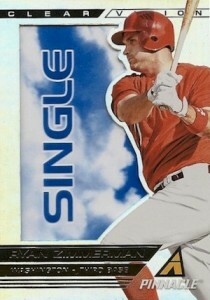 Given the reasonable price point, 2013 Pinnacle Baseball isn't a bad deal. A couple of boxes should get you a base set and leave you with a ton of inserts. 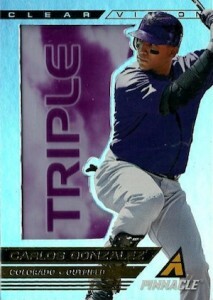 Even if you only want a few of them, it makes for great trade bait among team and player collectors. Two autographs per box is excellent, especially when you compare it to something like base Topps that delivers only one (Pinnacle does cost a little more but they're comparable). I like that Pinnacle is back. While the company itself may have gotten out of hand towards the end, their early sets were some of the best in the hobby. Breaking 2013 Pinnacle Baseball, there's a definite sense of nostalgia. And that's where it works the best. Given the reasonable price, there are some very cool elements too this set. My one big hope is that it can continue to find its identity and take a bit of a less-is-more approach when it comes to inserts. 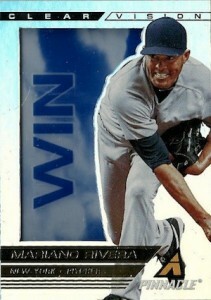 One card design I never liked was Pinnacle. It is a basic design, but still got a few things going for it. Box delivered as advertised. Always liked the basic card design, Nufex is cool, Acetate cards are nice too. Autographs were weak for me…Sean Marshall anyone? Overall, a nice set with some affordable inserts. Got in a group break . Definetly will buy again !! 2013 Panini Pinnacle Baseball Hobby Box (2 Autos) BRAND NEW & FACTORY SEALED!